Vineyards and grape varieties: 196.8 hectares (486.3 acres), of which 81% Pinot Meunier, 14% Pinot Noir, and 5% Chardonnay. Noted for: home village of the Dom Caudron cooperative. The map is linked from Wikimedia Commons, and the geographical information originates from OpenStreetMap. The dotted white area corresponds to the vineyards, light yellow is other open terrain, orange is built-up areas, and green indicates forest. The dashed red line in the left-hand part of the map is the departmental border between Marne (where Passy-Grigny is located) and Aisne. Comment: some of the village visible on the map are located outside the Champagne appellation, and therefore don’t have any village profiles. The church in Passy-Grigny, Église Saint-Pierre et Saint-Paul. Picture linked from Wikimedia Commons (photo GO69, 2011). Passy-Grigny is located on the right bank of the Marne river, which means north of the river, but not directly at the Marne. The Passy-Grigny commune covers 1199 hectares and has 379 inhabitants (as of 2014), referred to as Passiats-Grigniats and Passiates-Grigniates. The vineyards in Passy-Grigny are located in several parts of the commune. In the northwestern part, north of the stream Ruisseau de Champvoisy, there is a block that is continuous with the vineyards in Champvoisy and Sainte-Gemme. To the west and southwest of the village there is a block that is continuous with the vineyards in the northern part of Verneuil. Finally, there are smaller blocks of vineyard in the western part of the commune (south of the Ruisseau de Champvoisy), east of the village, and in the southeastern part of the commune. The vineyards consist of mild slopes of different directions, including southeast-facing slopes, with Pinot Meunier as the most common grape variety. The current vineyard surface in the Passy-Grigny commune is 196.8 hectares (486.3 acres). There are 159.5 ha Pinot Meunier (81.1%), 26.8 ha Pinot Noir (13.6%), and 10.5 ha Chardonnay (5.3%). Numbers from CIVC, as of 2013. In 1997, the vineyard surface was 185 ha. There are 62 vineyard owners (exploitants) in the commune. Benjamin Rogge (ND), whose Champagnes are produced by Boizel in Épernay. Boizot-Delionnet (RC, Facebook page), whose range includes a vintage Champagne. Renée Caillot (RM), has just over 7 ha of vineyards in Passy-Grigny and Troissy. The vintage Champagne is composed of 50% Chardonnay and 50% Pinot Meunier, vinified in oak barrels. The range includes two 100% Pinot Meunier Champagnes from old vines: Vieilles Vignes and Renée Philippe, where the latter is vinified in oak barrels. Robert Caillot (RC), has 7 ha of vineyards. Garnier-Causin (RC), whose vintage Champagne Cuvée Lorenzo is composed of 50% Chardonnay and 50% Pinot Meunier and is vinified in oak barrels. La Mystérieuse Vieille Vigne is a 100% Pinot Meunier from old vines. Marc Houelle (RC), has 6 ha of vineyards with 94% Pinot Meunier, 5% Pinot Noir, and 1% Chardonnay. Jean-Christophe Legendre, has about 10 ha of vineyards, mostly located on the right bank of the Vallée de la Marne. The range includes a vintage Champagne with a majority of Chardonnay (refers to the 2003 vintage). Laurent Lequart (RC, Facebook pagr-sida), has 10 ha of vineyards in Passy-Grigny and are members of village cooperative. The vintage Champagne is composed of 50% Chardonnay and 50% Pinot Meunier, and is vinified in oak barrels. Prestige Pur Meunier is a 100% Pinot Meunier vinified in oak barrels. The same Champagne with a higher dosage (54 g/l sugar = doux) is called Sweet Prestige. Jean-Michel Pelletier (RC), with vineyards in Passy-Grigny, Saint-Gemme, and Verneuil. The vintage Champagne is called Cuvée Anaëlle. The top Champagne of the range is called Cuvée Candice and is a Pinot Meunier vinified in oak barrels. Rogge-Cereser (RM), also written without a hyphen (Rogge Cereser), member of Vignerons Indépendants with 10 ha of vineyards and an annual production of 70 000 flaskor. The range includes a vintage Champagne. Thevenet-Delouvin, located in Passy-Grigny and Cersuil (Mareuil-le-Port) and uses oak barrels for parts of their range. The range includes a vintage Champagne namned Les Quatre Saisons. The winemaking museum at the cooperative producing Dom Chaudron. Picture linked from Wikimedia Commons (photo ADT Marne, 2014). 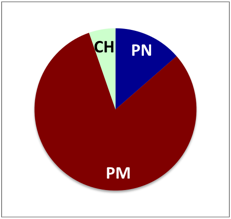 UMC’s village profile of Passy-Grigny. This entry was posted in Champagne villages and tagged Passy-Grigny. Bookmark the permalink.